Migraine Monologues: Migraine Awareness Week 2013: Blog Challenge and Prompts. Get Involved!! Migraine Awareness Week 2013: Blog Challenge and Prompts. Get Involved!! This year MAW(migraine awareness week) runs from the 1-7 of September. I will be posting a special blog each day of the week and I’d love you to join me. Below are a list of prompts (be inspired and don’t feel you have to stick rigorously to these) for each day. I will post a link to your blog post if you send me the link by 9am on the day. For the first blog prompt – I would love to start with a huge, joint, blog from the UK migraine community. To join in, send me a picture of yourself mid-migraine by Saturday August 31st and I will put together a montage of our faces! I will also link to a blog post from your own site too, if you’d like. Yes, the prompts are all from musicals. Deal with it. I have taken some of these from the fabulous Teri Roberts, Diana Lee and Ellen Schnakenberg who organised a similar blog challenge for Migraine Awareness Month in the U.S.A. Thank you Ladies! Get writing and raise awareness! Phantom of the Opera: “Masquerade” - Behind the Mask – What does a migraine really look like? What symptoms do you hide from others? Please send me a photo of yourself mid migraine before Sat August 31st if you want to be included in this joint blog post. Carousel: “You’ll never walk alone”. Where and from whom do you get most support? Your GP? Friends? Migraine Charities? How do you find comfort in knowing you’re not alone? Little Shop of Horrors: "Feed Me, Seymour": What comfort foods do you reach for when you have a Migraine or Headache attack? Do you follow any special eating plan? Mamma Mia: “Money Money Money”: How does living with Migraine or another Headache Disorder impact your financial situation? How much have you spent on migraines in recent years? Rent: “Seasons of Love”…Five hundred Twenty-Five Thousands Six hundred minutes. How many days did you lose in 2012 to migraine? Or how many days have you lost so far in 2013? Look at your migraine diary and try to estimate days lost to migraine. Evita: “Don’t Cry for me Argentina”. Do you want empathy and understanding? Do you want sympathy? Do you ever NOT want to talk about your migraines. Why? When? Les Miserables: “I Dreamed a Dream”. What would your fantasy dream, migraine free, day look like? There are no limits, you are a perfectly healthy person and the world is your oyster. What would you do? Remember to use hashtag #MigraineAW2013 and link back to this blog. Or #MHAW2013 (so as not to be confused with Make a Wish). Also use all the usual hashtags #migraine, #headache, #chronicmigraine, #awareness. If you don't want to write a whole blog post, but just have a comment, contribution of any sort, do email me and I'll include it in the day's main post. The Migraine Trust have posters and leaflets for the week. I shall be wondering about my hood making every and anyone display them. Order your pack, plus a info pack will be sent to your local G.P. The Migraine Trust, National Migraine Centre and MigraineAction all have ideas on how you can get involved and help them out this year. Share facts and figures: Every day on Twitter and Facebook share a fact about migraine to your friends and followers. 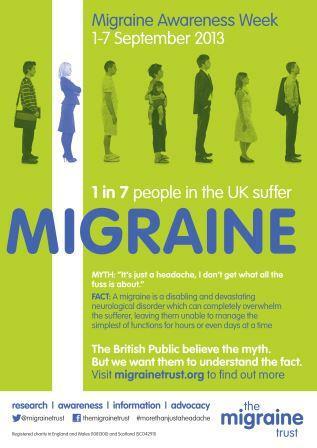 The Migraine Trust has a good fact sheet here and also via the National Migraine Centre. The American Headache and Migraine Association also have this fact sheet. People with mental disorders also are also at an increased risk for chronic migraines headaches and tension headaches.